This post must come to you as a surprise ; I mean, who wants to look at pictures of failed pastry ? And what kind of a blogging nut wants to show the world that she is inept at what she does ? Well, for one, I do. My blog, photos included, serve as a backup for my often failing memory or lost notebooks. Please note that I will not authorize and post any disobliging comments as regards to my age (fifty-something). Secondly, by sharing what didn’t work when baking gluten free might be of help to those struggling out there to make something tasty. Anyway, back to the real story behind this post. As you know, I make gluten-free French choux pastry (I mean, didn’t I label my post as «a fool proof recipe »?) and so felt pretty confident when I decided to make éclairs that I wanted to fill with a no sugar-added dairy-free whipped cream. I know, right there I was looking for trouble. As I am also trying to get rid of starches whenever possible, I decided to use : rice flour + millet flour, in equal amounts, (35 g each) rather than 30 g of each + 10 g of cornstarch. Since the no-starch combination worked with rice + teff, I didn’t think it was a big deal. I also used olive oil instead of rapeseed oil, not having any on hand. 1. The resulting dough, after I put in the egg, felt somewhat runnier than what I was used to. Still, I got out my brand new piping equipment and piped éclairs onto parchment paper, as usual and proceeded to bake. 2. In the oven, the pastry didn’t seem to want to puff up very much. I followed my own directions, resisted the temptation to open the door and let them cool down inside the oven. 3. As you already know from the blog photo, after cooling down, those things did not look one bit like what I had expected. They had flattened so much I could not attempt to cut and fill them. Still, they didn’t taste bad at all. We had them with coffee. Ok, I still need to hone my piping skills, but the éclairs came out much fatter and I will be able to fill them. Millet flour naturally lacks in starch, but teff has this special feature that makes it one of my favorite gluten-free flours. Way back, my first attempt at gluten-free ravioli was with millet flour ; again, when I switched to teff, I was pleasantly surprised at the taste. Thank you, I try. My husband keeps saying I am a “very trying person”!!! Dutiful neighbour here. 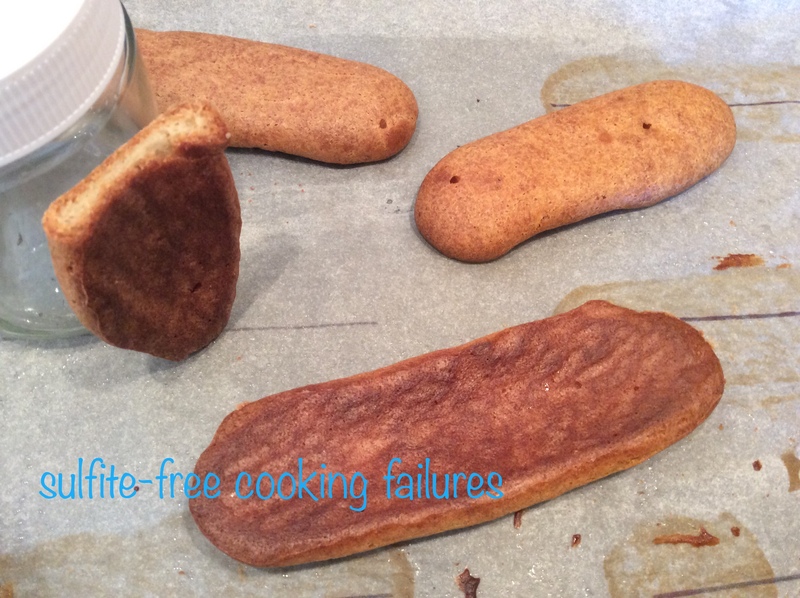 I always, not enjoy, er, find failure posts interesting as a learning device, thank you for sharing, Joëlle. I myself never fail, never, not once, okay, way too much, but any failure that teaches us isn’t a complete loss in my book. I do have a suggestion, it might be of no use, but it’s something I’ve found really interesting, but haven’t put it to extensive testing. I learned of using apple purée, among other purées, in baking from https://cookingwithoutgluten.wordpress.com and I’ve found it does remarkable things. It can lighten and even help tighten up doughs. It might not be of any use to you, but as a diligent neighbour I thought I should mention it. In truth, though the recipe didn’t pan out as expected at first, I can say with certainty I’ve failed more spectacularly in my time. Not that I’m bragging, I’m just that good at failing. Heh. The final éclairs look fantastic. It really shows the worth of sticking at it even if there’s just a slight hope. Wonderful! Take care, dearest neighbour! Thank you for commenting, dear neighbor! I was hoping that this post might initiate an exchange and your comment is welcome. Thank you for the tip; I wonder if the pectin in the applesauce is what makes it work. Another experiment for me to make!